Norris, M. J, Patrick, D, & Ostler, N. (2013). 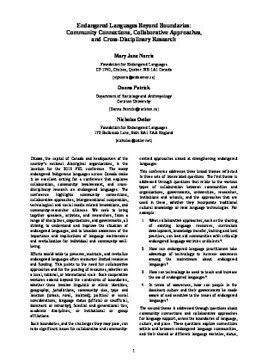 Endangered Languages Beyond Boundaries: Community Connections, Collaborative Approaches, and Cross-Disciplinary Research. In Proceedings of the 17th Foundation for Endangered Languages Conference (pp. 1–5). Foundation for Endangered Languages.